If you want to carry stuff on your bike, you basically have three ways to go. You can ride around wearing an enormous rucksack, which seems insane but is surprisingly popular in some places I've visited, for example France, where the sight of somebody on a $6,000 road bike wearing full racing kit with a 50L rucksack on wasn't that unusual. One German guy I met also had a pair of leather dress shoes and cooking gear hanging down from the back of his. That guy's neck must have been killing him. Anyway, that option aside, you can either put panniers on your bike, or attach the bags directly to the frame. Panniers are great for on-road touring, not so great off-road where they have a tendancy to try and shake your bike to bits - and then there's the extra weight. For all-surface touring, a better option is to use directly attached bags like those from Revelate Designs in Alaska. The setup I use has all the bags except the ones that fit in the inner frame triangle - I didn't use those so I'd be able to mount three bidons inside the frame if I needed to. I won't wear a rucksack when touring, everything goes on the bike. Very recently (April 2016) I walked into a bike store in Wellington New Zealand (Burkes) and saw the entire range of Revelate Designs bags hanging in the accessories section. Three years ago, when I upgraded my kit and went Revelate, no-one in any bike store anywhere in the country knew what I was talking about, except for one mail order outfit (Cycle Tech). I got some stuff from them and the rest from Revelate directly. Now everyone has them, and once you have them, you'll see why; they're terrific. Especially the handlebar (Sweetroll) and seat post bags (Viscascha) which are the basis of the setup. I can carry my tent and sleeping bag plus some other stuff (sunscreen, insect repellant, hat and overtrousers) in the Sweetroll because all my stuff compresses down small. That leaves almost everything else I need in the Viscascha seat post bag - clothes, toiletries, first aid, spare tubes, towel, pillow, etc. Everything I might need quickly (bike tools, pump, ID, money, phone charger, lock, etc) is in the Gas tank or Jerrycan top tube bags, or at the ends of the Sweetroll. I have no relationship whatsoever with Revelate (or any of the other brands mentioned on this site), but highly recommend their bikepacking gear. It's brilliant, and I'm not surprised there now seem to be a lot of very similar products out there. Gear setup for France. The is pretty much the minimum I can get away with for an extended tour. It has everything except food and cooking gear. This is my favourite loadout. The Revelate Viscascha seat post bag is the best piece of kit I've ever bought. Genius design, really versatile, and very tough. One obvious difference between using panniers and the frame bag setup I use is that your gear is attached higher up on the frame of your bike. This is excellent if you have to push it through a river (not my favourite method of crossing a body of water, but sometimes unavoidable), or even ride it through a deep puddle, but your centre of gravity is much higher and the bike can become top heavy. Some guys who're into MTB touring use trailers to get rid of the weight off their bike... but sod that. I just try to remember to compensate for it, especially when getting on and off. You really can make an arse of yourself when dismounting if you pick a busy place to forget how top heavy your bike is. Cobblestones are excellent ground for this type of work, ideally in a crowded square. One thing you should check before every set-off is that the bags are firmly attached and, crucially, can't sway from side to side. This seems like baby steps, but Hell mend you if you don't. One sunny winters morning a while ago I visited the farmer's market in Wellington and bought a load of fruit and veg. This went in the Viscascha which then weighed about the same as when I take it out on a fully loaded trip. It being such a nice day I decided to take in Mount Victoria on the way home, and after sweating up there I took a long fast descent down Alexandria Road. Going round one of the snaking bends the bike started lurching from side to side (I happened to have the computer on and checking later, I was going 52km/h). I somehow stayed aboard, but the bike went phugoid and every time I touched the brakes it got much worse. It's amazing how quickly you can ask yourself, "last time I took the back wheel off and on, how tight did I turn that allen?" I eventually slowed it and the motion stopped suddenly. I sat at the side of the road staring into space for while, then started checking the bike. Nothing. But the Viscascha was hanging strangely, because I'd forgotten to attach the strap that holds it onto the seatpost. I prefer not to carry more than a day's food, and I usually don't take cooking gear. If possible I'll eat in cafes and otherwise survive on fruit and cold food from supermarkets and shops. This means I'm carrying the tent and sleeping gear, basic tools and spares for the bike, toiletries, clothes, money, ID and documentation. I don't carry many clothes, just enough so that at night if I go to a restaurant I don't look like a cyclist. I just wash them regularly. All of this, of course, is easy enough if the weather's reasonably good (ie not too cold, and you're not getting soaked every time you go out), you're passing shops every day or two, and you're never too far from a bike shop in case of a real mechanical you can't fix with basic tools. If not, you obviously need to plan more carefully. But I'm convinced the best way to tour is with the minimum amount of gear. You'll enjoy it much more. 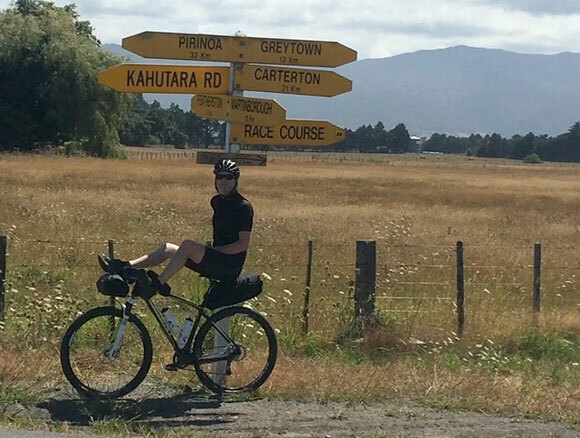 Similar setup in NZ, for a tour of the Wairarapa. 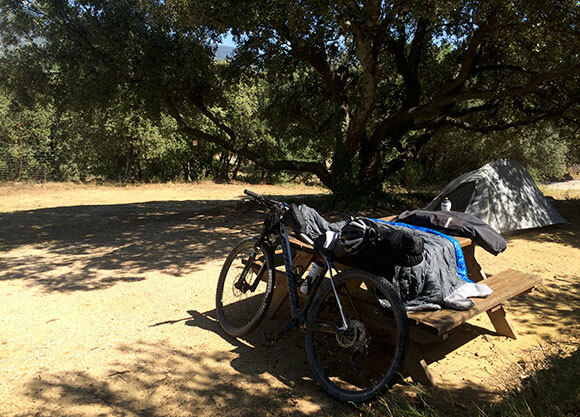 A completely awesome place for bike touring. Live in NZ or Australia (aka, the West Island)? Want to test out your kit before going somewhere less heard-of? This is it. It gets no better. Some people take an incredible amount of gear with them on bike tours. 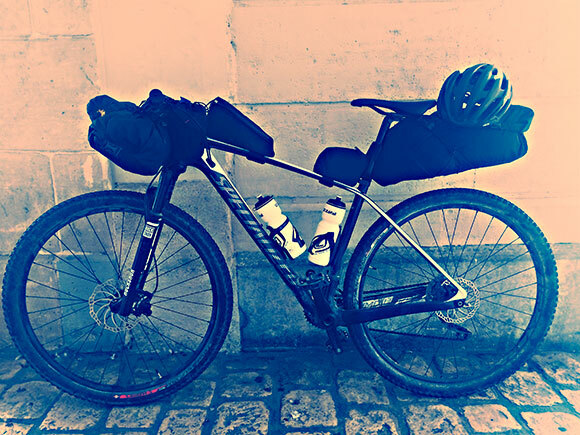 On the way to France in 2015, I ran into one guy, also bikepacking, who couldn't believe how light I was going. When I looked at his setup - he did, it's true, seem to have 3 times as much bag volume as me, all on racks - I was amazed to see what he was carrying. He had, for example, a folding chair. Also, fair enough that he had cooking gear, but his frying pan looked like the one I make curry in at home, and I also noticed that he had a 1.5L bottle of vegetable oil. I didn't see his tent but one assumes it might have been stitched canvas with 0.5in hollow tubing. Unless I need to really spend more than two nights in the boonies, or it's really cold, I don't take cooking gear, and just enough food to get me through a night. I don't want to carry a stove, pots, plates, stuff to clean them, fuel and cooking oil if I don't have to, and I'm certainly not going to carry them to use them the odd night. If you're doing the Tour Divide, fair enough. Otherwise I just take sleeping gear and a good book and go into the nearest village if I want a beer. You can't really test camping gear before buying, just read reviews. I went with a US company Big Agnes because they made about the lightest one person tent I could get at the time, the Fly Creek. It's made of space age stuff, it's amazingly light and packs down to almost nothing, but the penalty for that is it's gossamer thin and you really do have to be incredibly careful with it. In terms of waterproofing it was fine though, I waited out two thunderstorms in it and had no issues. One of the biggest problems you can encounter with small tents is condensation - it's not a problem at all with the Fly Creek, even if the outside is covered in cold water. I guess the trade off is warmth - this is a mild weather ultralight back / bikepacking tent, super breathable. It's not for cold weather stuff. You also have to be extremely careful with the poles; the first 1.5 cm from the ends of each section, where the connector sheath is, can easily split and separate, even if as I was you are very careful with them. Big Agnes supply a splint for use in the field. Get another one from them (or something similar from a hardware store) before going out for a long trip. Also carry some electrical insulating tape and check all the ends each time you put the tent up - where the composite pole material splits and bends outward it is sharp and will easily cut your tent fabric. I'm not criticising Big Agnes for these issues - they're what you get when you go to this extreme of the weight spectrum. For me it's easily worth it to keep your weight to the absolute minimum while still having an actual tent instead of a bivvy bag. 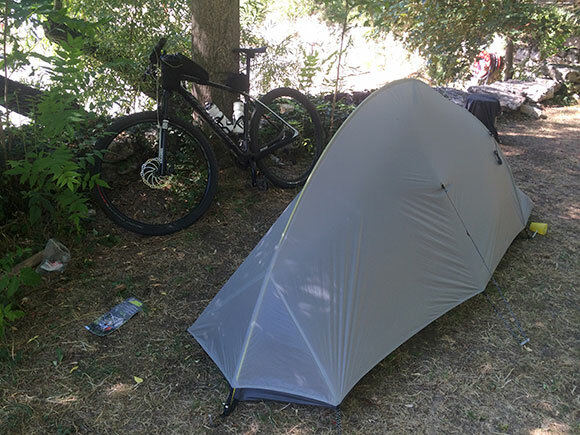 I'd rate this tent highly for anyone who wants to go ultralight bikepacking (or hiking), is prepared to be reasonably careful with it, and doesn't need to deal with extreme cold. The lost lake SL is a medium to lightweight bag rated for 0 degrees (Celcius). Having spent a lot of nights in it now I'd be happy to use it on the odd colder night than that. My rule for clothes and sleeping bag is that if I'm wearing every single piece of clothing I brought, inside the sleeping bag, on the coldest night of the trip, and I'm just warm enough to sleep, I brought just the right amount of stuff. I'm the type of guy who's happiest carrying the minimum amount of stuff. I like the SL 30. It's a mid-price bag which scores well with most of the features you'd look for, the main ones being weight, compressibility, warmth and performance of the loft. I've spent a few cold nights in it now and never had a problem with cold spots, except after cleaning and after the bag gets wet - I found I needed to get it 100% dry before it re-lofted properly. Where I've used it that wasn't often a problem, but if you were doing a wet, cold trip and the bag got wet - I could see you might have an issue. The XLite air mats are in a class of their own, but no ultralight air mat is going to be all that comfortable. On most trips my back takes about 4 nights to fully adjust to basically sleeping on a blown-up crisp packet.